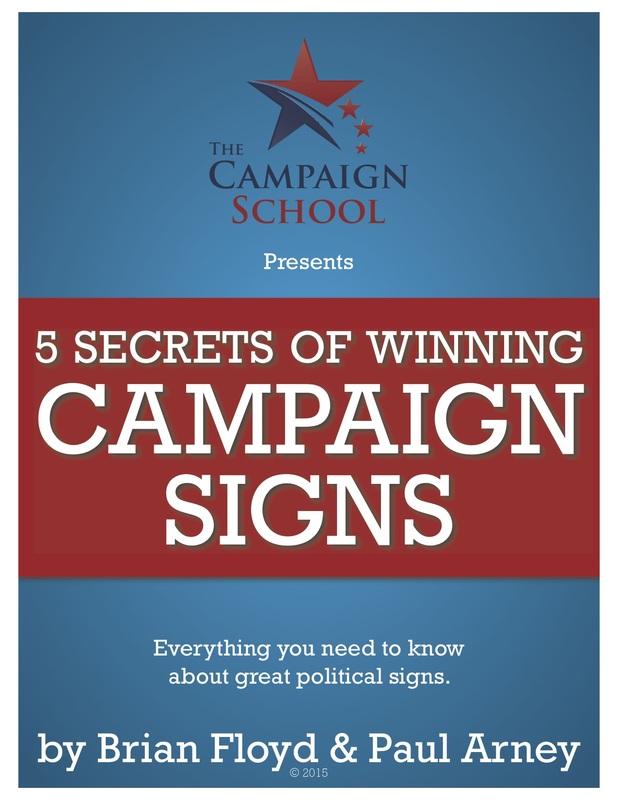 In my experience there are typically 10 main reasons candidates lose elections. Some of these can be avoided or fixed, others cannot. Knowing these reasons, seeing if they exist in your campaign, and making the right adjustments can make the difference between winning and losing. You may not like it, but raising money is an essential part of campaigning. If you’re going to reach the voters and win your election you’re going to need to buy signs, send out mailers, purchase voter data, pay for professional assistance, and so forth, you’re going to need money. I’ve seen too many good candidates fail to run an effective campaign because they lacked the financial resources. How to Avoid This: Set aside plenty of time during your day and week to make fundraising calls and meet with potential donors. Hire a professional fundraiser if need be and if you don’t have a fundraising list, start one by learning our Back of the Envelope Fundraising Strategy. If you don’t have a good story, you’re not going to connect with anyone. If you can’t connect with the voters, then you aren’t going to persuade any to vote for you. Too many candidates spend way too much time talking about themselves and things that aren’t important to the voters. They don’t have a story that resonates with the voters. How to Avoid This: First find out what’s important to the voters. Identify the issue or issues that cause them the most pain. Conducting a poll is a great way to do this. Once you know the key issue or issue, develop your plan that will make things better if you are elected. Then you can put yourself into the story as the person who can make it happen, but remember a winning campaign story is not about you. It’s about the voters. Too many candidates don’t know what to do with their time and their money, so they spend them on the wrong things – things that don’t help them win. They spend their money on campaign junk like coffee cups and bumper stickers, but not on mailers or phone banks. Instead of walking precincts and knocking on doors, potentially talking to 100’s of voters each day, they spend their scarce time at meet and greet events where maybe 20 people show up and half of them are already supporters. How to Avoid This: Devote your time and your money to things that connect with the most voters in the most effective way. You don’t have enough time nor money to do everything you want to do, so focus solely on the things that can get your message, your winning story, out to the largest block of voters. Hiring a professional consultant to create a campaign plan or to advise you on the entire campaign can help you focus in on what you should be doing, but the consultant needs to know what they are talking about and you need to listen and heed their advice. Not every district is friendly or ripe for the picking for every candidate. In partisan races, it will be difficult for even a centrist Democrat to get elected in a heavily Republican district. It’ll also be hard for a moderate Republican to win a strong Democratic seat. The party numbers are simply stacked against a member of the other party. Even in non partisan contests, if you hold views that are contradictory to the views of the majority of voters, you will have a hard time getting elected if you are honest about your positions. If you’re running in an area where the voters are predominantly composed of one ethnic group, and you are not of that ethnicity, you may have a hard time winning. Undecided voters often will cast votes for the candidate whose last name is most similar to theirs. It’s not prejudicial. It’s merely the human nature to default to the familiar. Should you be new to the area where you are running and haven’t established solid roots yet, the voters may not know you well to trust you yet and will have a hard time voting for you. In my hometown of Norco, California, a person who runs for office and hasn’t lived there for more than ten years is looked out with heavy skepticism, unless they’ve been very involved with the community. How to Avoid This: Do your research and known your district before you decide to run. If you’re running in a place where you are a major long shot for obvious reasons, you should probably look for a another office to run for. If you are new the community, you should sit this race out and volunteer on some other campaigns or with some local groups to establish the roots you will need to run and win in the future. Believe it or not, there are still some very popular incumbent elected officials in America. They are the ones who stay in touch with their constituents. Their votes and actions in office reflect the views and the values of the people who put them in office in the first place. Because of this, the name ID and the fundraising advantage of incumbency, these people are often very hard to beat. 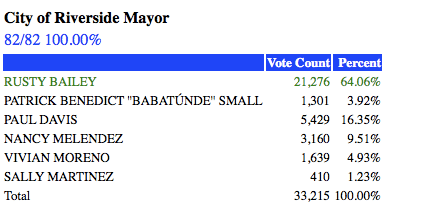 I saw this happen in Riverside, California this week where first term Mayor Rusty Bailey was seeking re-eleciton and facing off against five challengers, including a sitting City Councilmember. It is difficult, if not impossible to win outright with over 50% of the vote and avoid a runoff with a total of six candidates in the race. The day before the election, I told Mayor Bailey’s Chief of Staff that I thought he would finish in the high 40’s but it was next to impossible to get above 50%. She thought it was as Rusty remained very popular with the voters. I was skeptical but she was right, as the results show. 1) Find something that makes the incumbent seem hypocritical. If it’s strong enough and deeply riles up the voters, exploit it and make the campaign about that issue and keep the incumbent on defense the entire time. It could work, but it’s still a long shot. 2) Find an office without a popular incumbent, win the race, and build your own base of support. When the incumbent leaves office, you might be well positioned to be the successor. You might even ally yourself with the incumbent to get their endorsement when the time comes. The best way to beat an incumbent is to demonstrate for the voters that the incumbent is out of touch with what’s important. However, any candidate can be out of touch. They can talk about things that don’t matter to the voters or even worse, show little knowledge or concern for a major issue that is very much on the voters minds. Voters don’t for people who are clearly out of touch. How to Avoid This: At the most basic level you need to be active in your community and know what’s going on there and what matters to the people in interact with. To get a bigger picture of this for your district, a poll is always a good way to identify what’s on the minds of the voters. When you know that you can not only be in touch, but you can put together that vitally important winning story. I’ve told more than one candidate in my career: I can’t want to win the election more than you do. It’s true. No one can want to win more than the candidate. Do you want to win the election more than anyone else involved in your campaign? You must. A candidate who is not 100% committed to running and winning an election, is likely to lose. There’s no two ways about it. Often they learn that campaigning is harder work than they thought, and they’re just not able to do it. Sometimes demands from work or family pull them out of it. I’ve seen a health scare sideline a candidate. And if your spouse isn’t 100% behind your election effort, that will almost always undercut your determination to win. How to Avoid This: If you can’t put in the time and energy to run for office, for whatever reason, then don’t run. Unenthusiastic candidates seldom if ever make great elected officials. Your community deserves someone who’s all in, both in the campaign and if elected. Here’s a shocker for you, in campaigns scandals happen. The unfortunate part is that sometimes they happen to you and they derail your electoral chances. An opponent will bring out something from your past to smear you and paint you as unworthy of election. There will be a lapse of judgement on the campaign trail and you’ll say or do something you shouldn’t. These things are all ripe for the potential for scandal. Some will work and some won’t, but if the voters get turned off and don’t trust you, there’s a good chance you will lose. How to Avoid This: Be honest about your past. Let people know what happened, how you’re sorry, and how you’ve learned from it. If the voters let it go, then you’re in the clear. If they have real issues with it, then you may want to rethink running for office. The best way to avoid scandal on your campaign is to keep your head about you even when things are at their craziest. Always watch what you say, don’t play games with money, and no matter what, never ever ever tear down your opponent’s signs. Candidates who don’t get out and knock on doors are most likely going to lose. One on one communication, face to face, at the door is the best way for a candidate to win a person’s trust and their vote. if you’re not doing it, and your opponent is, there’s a better chance than not that you won’t be victorious on Election Night. How to Avoid This: Get out there and walk. Schedule time five to six day a week to walk precincts. Have a nice handout designed and printed. Knock on the doors of the highly likely voters in the most important precincts. Get signs placed in their yards. If you’re not willing to commit to a walk program like this, then you should reconsider running for office. Some candidates falsely believe the campaign is over long before the polls close on Election Day. They often lose. I know of a lady who thought she had won her State Assembly race a month before Election Day. Rather than campaigning she was “boning up on the issues.” She should have been campaigning. She came in third in that race, behind two other candidates who were still working. Another time the leader of the California State Senate lost his seat because he thought his race was sowed up and he went to walk precincts in another district. That’s just plain dumb. Frequently candidates tire out and stop campaigning the last few days of the Election. That’s when they need to be making sure your supporters have voted by mail or know when and where to vote. You should be actively working the undecided voters to come your way. Some don’t even campaign on Election Day, then find themselves surprised when they lose by a handful of voters. How to Avoid This: Simple, you campaign until the polls close on Election Day. If you’re in it to win it, that’s what you do. If you can’t or you’re unwilling to do that, then you should consider sitting this election out and waiting until you’re willing to make that type of a winning commitment to your campaign. When the polls close at the end of Election Day, there will be more losers than winners. There’s simply too many candidates running for too few offices in most cases. Many of those who don’t get elected will have fallen victim to one of the ten reasons listed here. Many of them are preventable and you can overcome them. Political campaigns are not brain surgery nor rocket science, but they do take discipline, focus, and a strong work ethic. That combined with the essential ingredients of solid fundraising, the right campaign story, and knowing how to best spend your time and money, almost anyone can run a winning campaign and make a huge difference for their community. Are there any other reasons you know of why candidates often lose elections? Please let us know.